100 years later, Sgt. Perry Loyd's battle scars were honored posthumously at Fort Jackson. Columbia, SC (WLTX) — The Purple Heart was presented posthumously Saturday to the late Sgt. 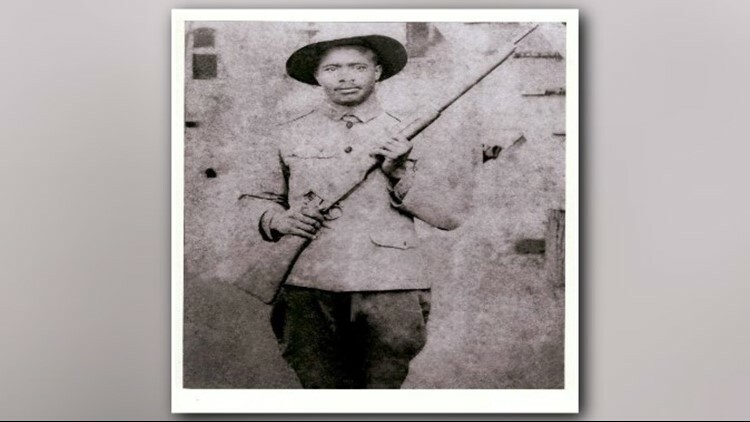 Perry Loyd to honor the Sumter County native's sacrifice during World War I.
Loyd served in the 371st Infantry Regiment, 93rd Division (Colored), at what was then known as Camp Jackson. Loyd was severely wounded in action on Sept. 29, 1918, during the Meuse-Argonne Offensive, a major part of the final Allied offensive of World War I that stretched along the entire Western Front from September to November, 1918. However, Loyd never received his Purple Heart. A hundred years later, his battle scars were honored as family, friends and soldiers gathered to recognize Loyd's service and his sacrifice. Among those in attendance to honor Loyd was his grandson and namesake, Perry James, who accepted the medal for his grandfather on Saturday at Fort Jackson. Although James never met his grandfather, curiosity and a little push from his wife led him on a journey of discovery that brought this honor to light. "When I found out about my grandfather, I told my mother and she said, 'Son, can you please get me his Purple Heart?,'" James said. "So, I went about doing the research to prove that he is deserving of a Purple Heart." It was an uphill battle. One that James said took much perseverance. "We'd gotten turned down a couple of times," James said. "I told my mother, 'Don't worry, don't worry.' I'm a salesman by trade, so I know not to give up." So, he contacted Senator Tim Scott's office whose staff helped him submit information to the Department of the Army and took time digging-up evidence. Finally, the day had come. "I was at my mother's house one afternoon and I got an email from Senator Tim Scott's office," James said. "'Your grandfather had been awarded the Purple Heart.' You would have thought we won the lottery for 20 million dollars the way me and my mother were jumping around the house." On Saturday, James accepted the medal on behalf of his grandfather and his family. And, although he never had the chance to meet his grandfather, he's happy to have him a little closer. "It's proof that my grandfather was a patriot, a war hero, and a leader of men," James said. "It gives me pride." Sgt. Loyd grew up in Claremont in Sumter County, South Carolina, and returned there after the war, according to his granddaughter, Teresa James Bracey. He met and married Ms. Rebecca Howard. Together, they had 15 children, 10 of whom lived to adulthood. He is buried at High Hill AME Church in Dalzell, SC. "Our mother, Elease Loyd James of Wedgefield,SC, is the only surviving child," says Bracey. The 371st Infantry 'Colored' Regiment was the first drafted colored regiment to fight in a combat regiment for the United States. 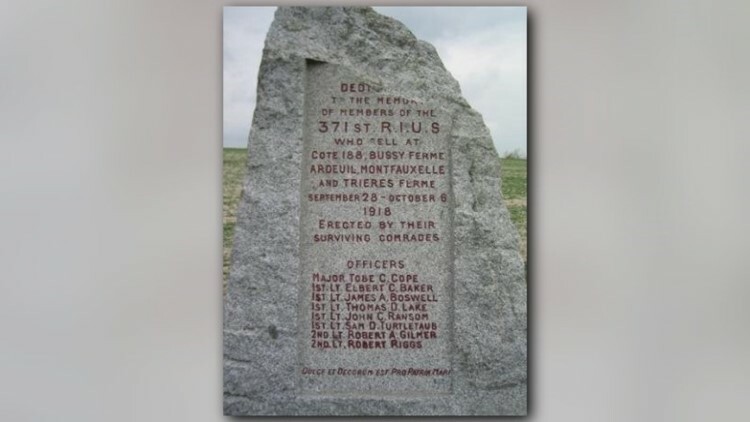 A stone monument with painted engraving on all four sides, honoring the 371st Infantry Regiment, 93rd Division (colored) stands in S&eacute;chault, France. The top of the monument was damaged when it was hit by an artillery shell in World War II. "My brother Perry, his namesake, honors our grandfather as a WWI Reenactor with Ebony Doughboys," says Teresa James Bracey. Perry recently traveled to Belgium to portray their grandfather in that country's celebration of the African-American soldiers' liberation of that country during WWI. "While in Europe, he traveled to France and stood at the exact spot where our Grandfather was severely wounded exactly 100 years to the date." Bracey says. A movie is being made about the African-American soldiers of WWI, and the film crew was in Belgium filming Perry's reenacting group with hopes of using that footage in the movie, according to Bracey. "We, [Loyd's] family believe that this is a story that should be told, even if it's 100 years later."